Imagine an hour…a day….a week without speech. Imagine not being able to say ‘I love you’ this Valentine’s Day. Unfortunately that is the fate met by most people living with Motor Neurone Disease (MND). Patrick (Padge) Kelly is 28 years old from Lucan in Dublin. Padge was diagnosed with MND in 2003 when he was 17. When he was in sixth year in school he noticed that his hand writing had become very messy and that he wasn’t as fast when he played football. One day when he was walking home from the shops with his Gran he found he couldn’t carry the bags for her. “I went from a limp to needing a crutch to a wheelchair. I can’t move my arms or hands. The worst of all is that my tongue, mouth and diaphragm has also been affected which robbed me of my speech. I could deal with being disabled but not being able to communicate with family and friends was difficult to come to terms with”, said Padge. 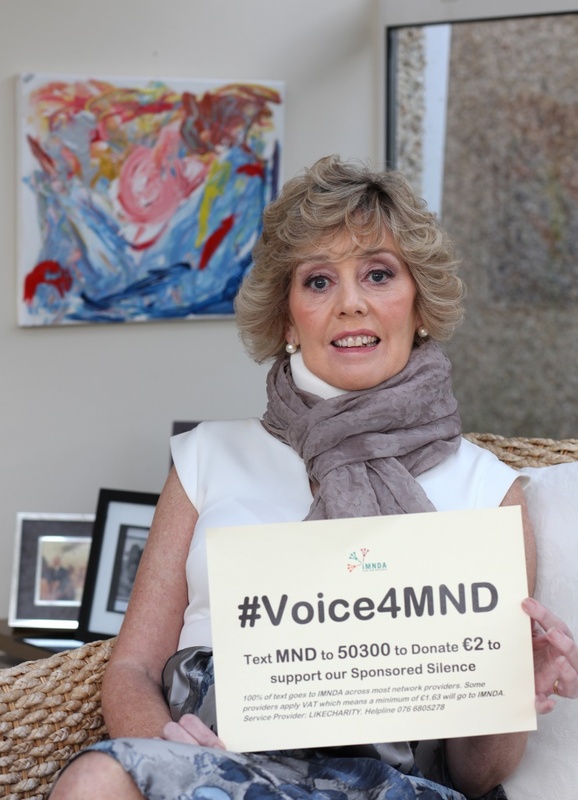 Esther Tracey is 58 years old and was diagnosed with MND in 2013. Esther is an amazing cook, and runs her kitchen with the precision of a professional. She may have lost her swallow and speech to MND but that hasn’t dampened her appetite for life. “The progressive symptoms which have left me without speech and swallow were daunting but with help from my family and friends I can communicate very well. Every challenging step along the way has consistently brought out the fighter in me and the support of the IMNDA has helped me to maintain a positive attitude to keep fighting this”, said Esther. This February we’re asking you to take on a sponsored silence to experience what life is like for Esther and Padge. How would you cope not being able to communicate? Just pick a day, time and location where you will take on your sponsored silence and then contact us on fundraising@imnda.ie or 1800403403 for your Silence Sponsor pack. 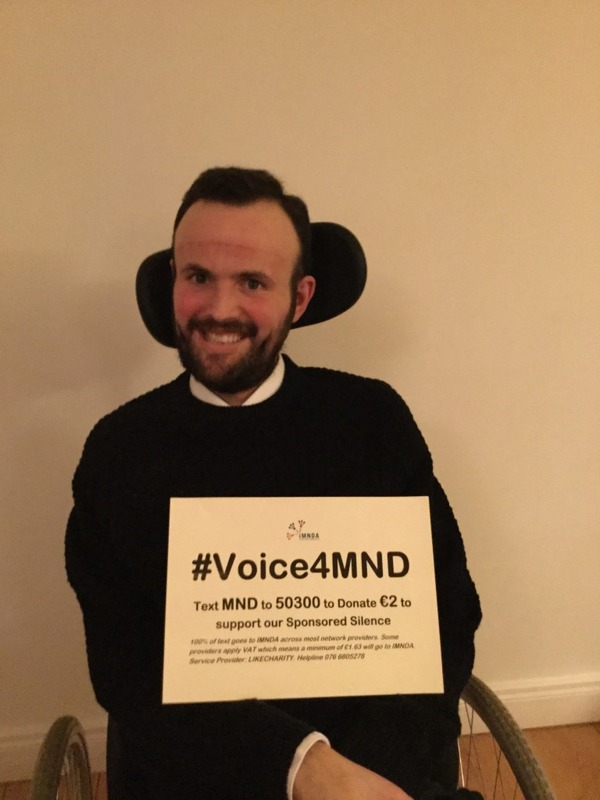 Spread the word on social media by using #Voice4MND and text MND to 50300 to donate €2 (100% of text goes to IMNDA across most network providers. Some providers apply VAT which means a minimum of €1.63 will go to IMNDA. Service Provider: LIKECHARITY. Helpline 076 6805278). Nominate friends and families to join you. Sometimes silence can speak volumes. Take on our challenge today to raise vital awareness and funds for the IMNDA. Don’t let Padge and Esther suffer in silence; don’t let them live without a voice. The IMNDA provides specialised services for people affected by this debilitating disease such as equipment on loan, financial assistance towards home help, advice and home visits by MND Nurse. In order to provide these vital services the IMNDA depends heavily on the generosity of the public and supporters of the association who generate over 86% of its income.